Maovember – An annual campaign that teams bars, restaurants, vendors & customers for good causes. This year's charities: Bread of Life and Library Project. The annual Maovember campaign teams restaurants, bars, vendors and customers for good causes. See our 2018 event list. Our 2018 partners are Bread of Life Bakery and Library Project. Learn more here and how to help here. 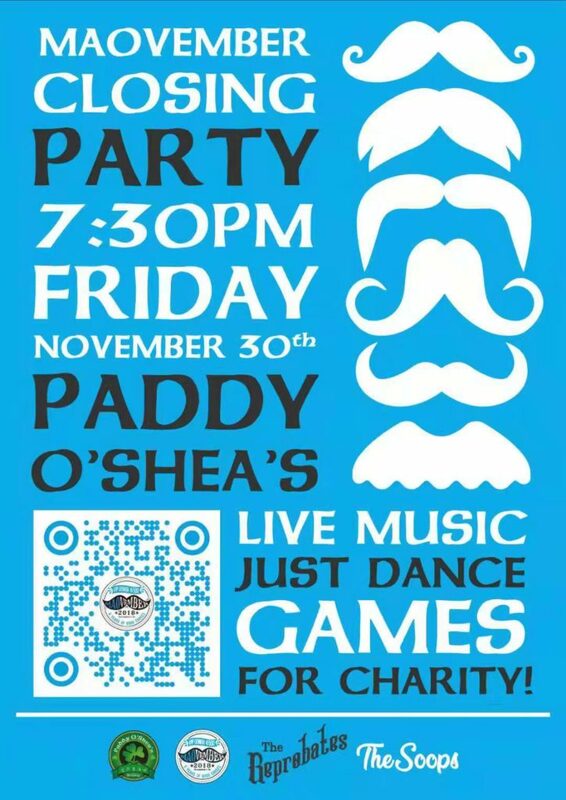 The Maovember closing party at Paddy O’Shea’s is a fun annual tradition and this year was no exception. The party featured Jameson pickleback shots inside and hockey shots outside courtesy of the Beijing International Ice Hockey guys, two bands, The Reprobates and The Soops, and a draw in which everyone who bought a pin won a prize, including bottles of wine, Paddy O’Shea’s merchandise, and more. With representatives Tom Stader from Library Project and John Bison from Bread of Life Bakery on hand to receive ceremonial checks, it was a good way to wind down this year’s campaign. The pickleback bar, games and donations raised 元2226. The draw, in which everyone bought a pin, raised 元1500. That meant 元3726 and a nice addition to this year’s Maovember total. The annual closing party at Paddy O’Shea’s is always a Maovember highlight: expect this year to be no different. The party will feature two bands, The Reprobates and The Soops, plus a Jameson pickleback bar, a raffle, a BIIH hockey shootout with Orchard Pig cider as prizes, and the Just Dance dancers (just dancing). Representatives from this year’s partners, Bread of Life and Library Project, will be on hand, and there is always the usual Paddy O’Shenanigans. Starts at 7:30 PM: see you there! You can check out the action from last year here. MaovemBEER 2018 saw five brewpubs in three cities—Beijing, Chengdu and Tianjin—team up for good causes on November 17! The idea was for each venue to have a beer deal and a game. Here is a wrap up for each place, in alphabetical order. Arrow Factory donated 元5 for each beer sold that day, including the buy one, get one free select brew deal. There was also a draw for a 24-bottle case of Clone Easy Ale, an Arrow Factory T-shirt and a 元100 gift voucher, with tickets at 元20 each. The event raised 元720, reports AF’s Justin Culkin. Boxing Cat featured 300 ml pours of TKO IPA for 元20 at its new bar and restaurant in Beijing. It also held a draw for merchandise and beer flights with tickets at 元15 each. All in all the event raised 元845, reports Boxing Cat’s Terry. Jing-A held a pub quiz in the Back Bar, with round winners getting picklebacks and overall winners getting merchandise and more. Plus, picklebacks were sold at 元25 for charity. The total raised was 元525, reports Emmy Andreasen. Lordrew and Sonny Gyalzur, from Nanmen and Shangri-La Beer respectively, teamed up to host a beer pong tournament. The 元500 entry fee got teams free T-shirts, openers and beers from both breweries. Each brewery also had a dedicated tap, with all proceeds to charity. The total raised was 元6600, with 元3000 from team fees and 元3600 from beer sales, reports Lordrew. And last, but certainly not least, WE Brewery held a corn toss tournament, with a 元500 entry fee that opened the door for plenty of prizes for players. WE also had a “tab war”, with the highest bill going MVB to, and a draw, with tickets at 元10. The event raised 元16,000, including 元3500 from team fees, 元4000 from draw tickets, 元5629 from the “tab war” and 元2871 from donations, reports Steve Wang.